The weekend of February 24th & 25th was marked off on my calendar for a while, but I wasn’t sure if I would have the courage to go through with it. 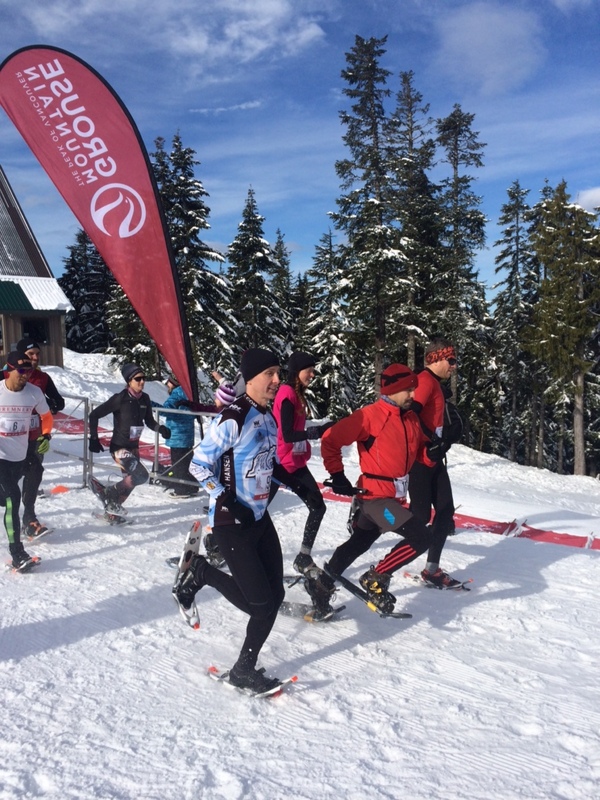 The idea was to attempt the Sigge’s P’ayakentsut (P’ayak) 50km cross country ski race in Whistler on the 24th, and then the Grouse Mountain Snowshoe Grind race on the 25th. 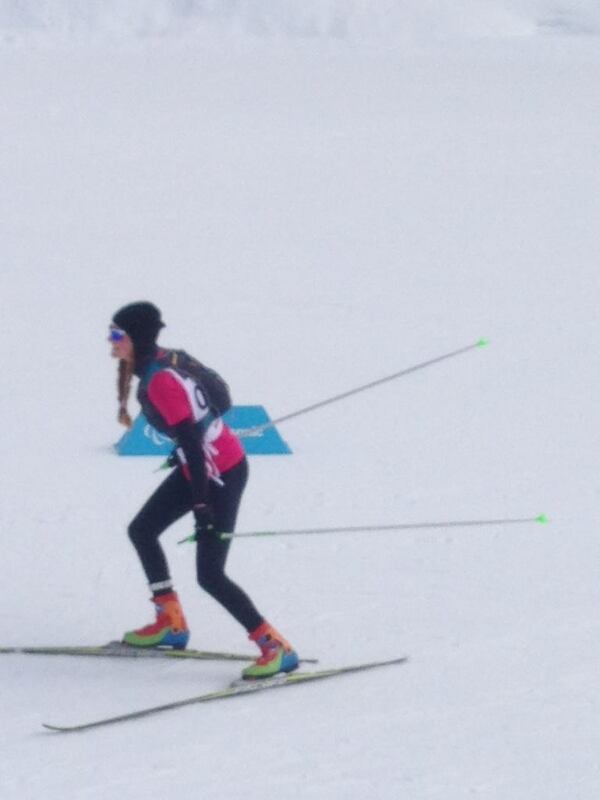 I had never done a cross country ski race before, or a snowshoe race. (Sure, I do snowshoe quite a bit, but my cross country skiing is a disaster.) I wasn’t too worried about the snowshoe race, but how would I be able to do it if I was semi-destroyed from the ski race? When the idea came to me, I was hoping Joanna & Arielle would bring their Canmore Nordic Center abilities and their enjoyment for weird weekends like this. (Three suddenly feels like this is a popular idea.) I messaged them, but Alberta is far, so they weren’t going to join. I tried recruiting others by saying if they also did the “P’ayak / Grouse Double“, I’d buy them a beer. (There were no takers.) Even though it was clear I would be doing this alone, the uncertainties intrigued me. It all seemed foolish, but fun. I decided I would sign up at the last minute. On the day before the epic snow race weekend, my blisters finally healed up from the previous weekend of ski touring in the wrong boots. I was ready! Because I haven’t skied a lot, the cutoff time looked really scary to me. (My first 25k had to be done in 2.5 hours.) Heck, I can spend over one hour just eating a meal and putting my shoes on. Wax my skis for the first time ever, which should yield about 1k an hour. Stop at all the aid stations and devour lots of Clif bars. Start at the very back of the group, and don’t go anywhere near the real skiers. If timing gets close, just take off skis and run! With this plan in mind, I took to the start line for the 50k with about 50 other skiers. The start confused me because there were all these classic tracks, and I thought we were doing a skate ski race? Confused and having never been in tracks before, another skier confirmed that I was in the right race, and that we were all meant to start within these tracks. I went inside a track doubtfully and waited for the start. Within the first kilometer I was about 5 minutes back from the entire race, and I wondered what the hell I was doing! I navigated the turn-offs doubtfully and started to feel great anxiety for what lay ahead. It didn’t help that I had never felt the sensation of waxed skis before! Adding to my anxiety, after a while the 30km race began and hundreds of skiers came flying by on the narrow trail downhill. Meanwhile, I prayed I would not get trampled. My prayers were answered not only in avoiding the trampling, but being given a ski buddy! On one of many awkward moments in the race, I stopped for a minute wondering where to go. Just then, Raj skied up behind me and showed me the right direction, and it turned out we were exactly the same pace. 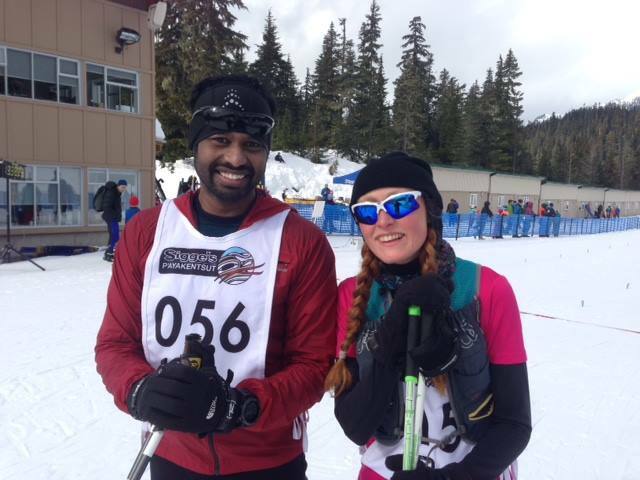 From that point, which was about 5k into the race, we skied the entire 45k of the race together! It was amazing to have a buddy to laugh with, and to celebrate. Because Raj was wearing a GPS watch, at some point we both realized that we were well within the cutoff times, and we were skiing the route much faster than we had expected. So, for the whole second half of the race, it was pure smiles and laughs. We finished! And although I came dead last in the women’s category, it didn’t matter at all. I felt so proud to have finished, one hour ahead of what I expected, and I even beat my best 50km run time, which I wasn’t expecting. It’s interesting to know that you can come in last, but still feel proud! I felt great after the P’ayak, admittedly, my “just try to finish” cross country ski race style is much, much easier than my “try to kill yourself” running style. After lots of food, I was in great spirits, feeling surprisingly springy, and ready for day 2! Raj skied 45k with me! Note that, as a joke, the t-shirt I was wearing was from the Golden Ultra and had a giant bulls-eye on the back that said “Leader”. Thankfully no one saw that, or they would have been really confused! Let’s be clear, I run the Snowshoe Grind every single week, twice a week, as part of my fun job guiding at Grouse Mountain. So, I know the course pretty well… I knew this course would be really fun as a race, because it was only about ~20 minutes of work going uphill, then a fun downhill reward, to the finish. Warmup… it’s such a short race that I felt a warmup would actually be useful. And mostly, to have fun! The weather was looking perfect, and it was just turning to a bluebird day as the race was getting started. Plus there were so many friendly faces around with Ian, Herman, Ray and Daniel racing in the men’s, and Allison, Nancy, and fellow Grouse guides Lesley and Kristina racing in the women’s, plus a fun surprise– Terry Bremner came to watch! 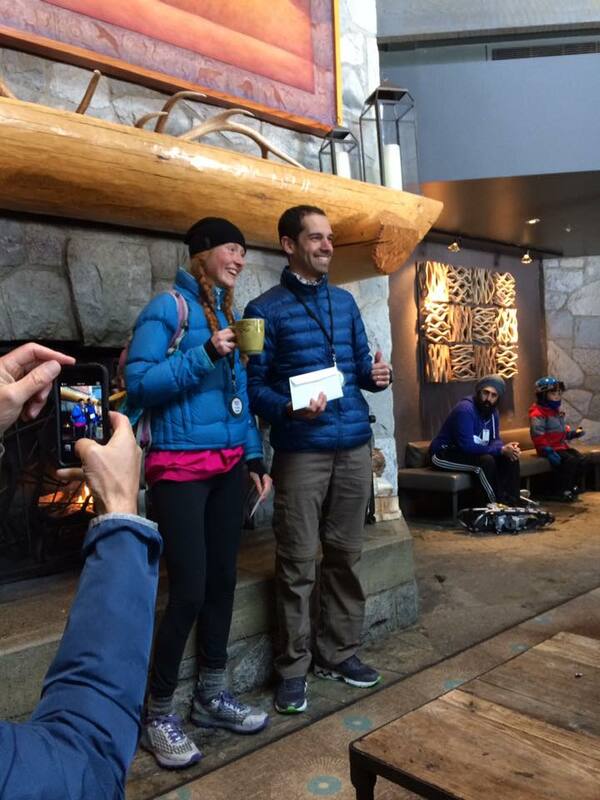 Party dress finish at the Grouse Snowshoe Grind. Great racing by Herman & amazing cheering by Terry Bremner! Overall, the random snow sports weekend was such a blast. I know a lot of people have an attitude where ski touring is at the top, and then resort skiing, and then everything else is below it. But for me, it’s so much fun just to be outside doing all types of activities. It’s fun to try new things, becoming humbled from some and gaining confidence from others. And once in a while, getting a surprise with doing much better than I had expected! 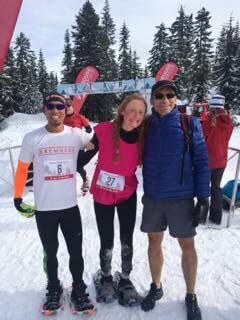 With Snowshoe Grind winner Paulo, great job Paulo!